Riga. In the Latvian capital, last night, thousands marched in defense of the Russian language. The main slogan of the procession – “Assimilation – no!”, was written in three languages: Russian, Latvian, and English. Also people chanted: “Hands off Russian schools!” Police guarded the procession. The demonstration passed without incident. According to the co-chairman of the Russian Union of Latvia, Miroslav Mitrofanov, about five thousand people took part in the protest. 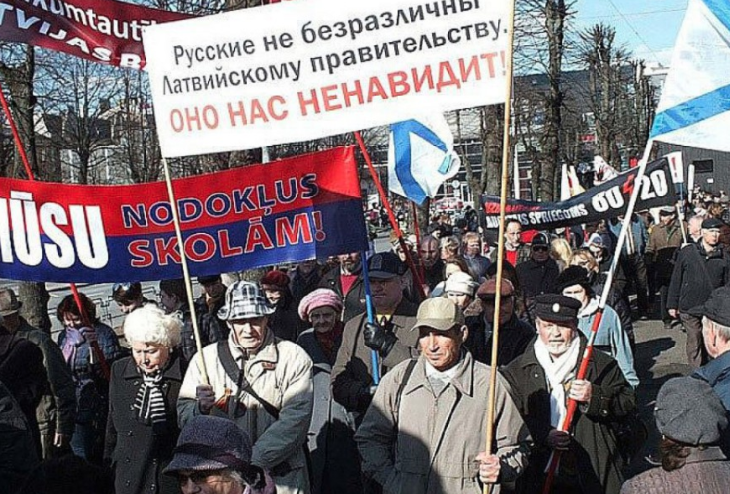 In Latvia, measures against the Russian language may be worsening. In November, the national association “All-Latvia”, which is part of the government of the republic, proposed that the Seimas amend the labor law, stipulating that the employee, in carrying out his duties, has the right to communicate with the inhabitants of Latvia only in the state (Latvian) language. Recall, in October it was reported that training in Latvian schools until February 2018 will be translated only into Latvian. Earlier it was reported that Mayor of Riga Ushakov again rose to defend the Russian language in the schools of Latvia. According to the leader of the Russian movement of Latvia, the former deputy of the Riga City Council, the head of the international human rights NGO “Give us our names back” Ruslan Pankratov, such statements are only a cover for real anti-Russian actions by Ushakov and the Latvian authorities. Speaking Russian to be illegal in Donetsk!